Florida is flip-flops at breakfast, lunch and dinner. Florida is Disney, SeaWorld and Universal. Florida is swaying palms and creeping jasmine, live oak and bamboo. Florida is ‘gators’, panthers and gentle manatees. Florida is 825 miles of beaches. Florida is the fishing capital of the world and a diver’s delight. Florida is Mercury, Gemini and Apollo, and the first space explorers. Florida is fresh oranges and grapefruit outside your door. Florida is baseball, motor racing and golf. Florida is Art Basel and art deco. Florida is sunrise on the Atlantic and sunset on the Gulf of Mexico. Some places and times just go together, and South Beach seems right now to be one of those places, embodying the cultural mix of fashion, celebrity, design, hip beach culture and wealth that defines American fabulousness. The city's location as a kind of centre point between Europe, New York, L.A. and South America has no doubt contributed to its current ascendancy, but credit must also go to Miami’s architectural forefathers, who between the late '20s and early '40s built a backdrop as beautiful as today's bronzed and buffed denizens. 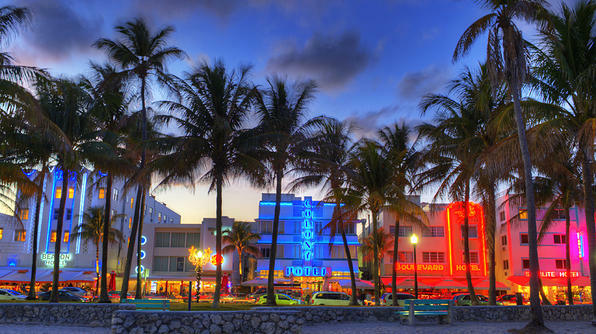 South Beach’s Architectural District—aka the art deco district—crowds into a mere one square mile some 800 pastel-coloured buildings in the art deco, streamline moderne and Mediterranean Revival styles. Altogether, it is the largest concentration of 1920s, ’30s and ’40s resort architecture in the U.S. Tours are available from the Miami Design Preservation League, but there’s every chance you’ll get distracted from the architecture—all painted in the district’s trademark teals, lavenders, pinks and peaches—by the alarmingly good-looking parade of people on and off the beach. On Ocean Drive, the 24-hour News Café was one of the fixtures of the South Beach renaissance and is still one of the best people-watching spots in town. Five blocks away, News Café spinoff Café Cardozo (in Gloria Estefan’s Cardozo Hotel) lets you step out of the path of the year-round tourist crush while still enjoying people watching. On Lincoln Road, the half-retro, half-chic Nexxt Café serves models and film stars from a huge menu. At night, head to Crobar for dancing and gawking, the Delano Hotel’s Rose Bar for cocktails or the Shore Club’s SkyBar, where all the world’s a stage.